The video courses, produced by Terry Carter from Uke Like The Pros are a great way to get a structured format to your learning and to ensure that you continue to develop as a player over a period of time. I’m a big fan of structure learning formats like books/ebooks and courses as I think they provide the focus that progression requires. I played guitar for many years and never really got much better. I can play chords, strum and do a little fingerpicking but I could have been so much better. The temptation to learn part of a riff proved too much for me and as a result I pretty much remained at the same level. 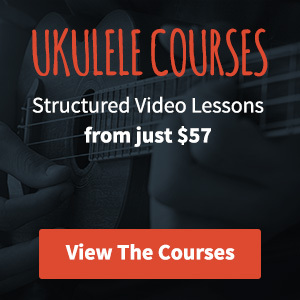 There are four courses currently available: Master The Ukulele Level 1, Master The Ukulele Level 2, Music Reading For Ukulele and 23 Ukulele Chord Progressions. You can find more out about the ukulele courses here. All of the courses are a mix of video, sheet music and backing tracks and start from a very reasonable $47 (one time payment). You can learn at your own pace and commit as much or as little time to working your way through them as you feel comfortable with.